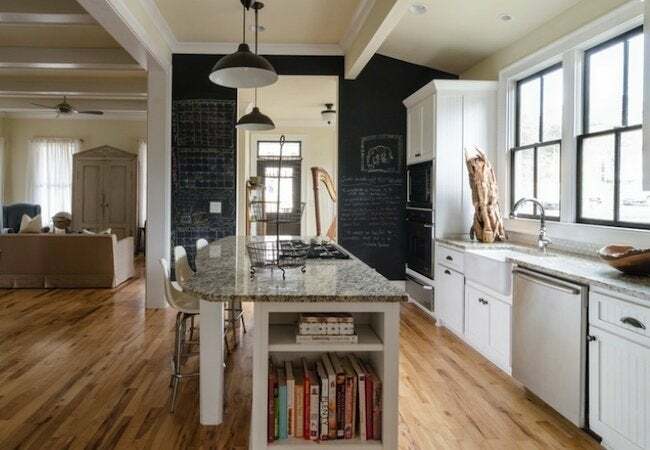 Chalkboard paint has so many uses, both practical and playful, but it comes at a price and selection can be limited. Get all the fun for less by making your own. Chalkboard paint lets you transform any wall into an endlessly reusable writing surface. Although it’s readily available online and in stores, chalkboard paint, which retails for about $25 per quart, doesn’t come cheap. Plus, it’s available in limited colors. Good thing it’s so easy to eschew the store-bought variety and make it yourself. When you make chalkboard paint yourself, it’s first and foremost cheaper—but even better, you can create virtually any color you want! • Most local hardware stores, paint supply depots, and home improvement centers offer deep discounts on paint cans that other customers have returned. If you like one of these returned colors, capitalize on others’ misfortunes by purchasing as much discounted flat-finish latex paint as you think you’ll need for your project. • In stores, you can usually find packages of grout only in quantities larger than what’s necessary for making chalkboard paint. So unless you have a big tiling job on your to-do list, try to acquire a cup or two of grout from a friend or neighbor who has recently completed some remodeling work. Unable to purchase discounted paint in the perfect color for your space? Don’t fret! You can close the gap between what you have and what you want by mixing in white paint to create lighter tones. In this way, a rich brown can be coaxed into a soft tan, or a deep purple can be softened into a lavender shade. Once you are happy with the paint color, add the magic ingredient: grout. For a successful batch of chalkboard paint, one to eight is the recommended ratio of grout to paint. 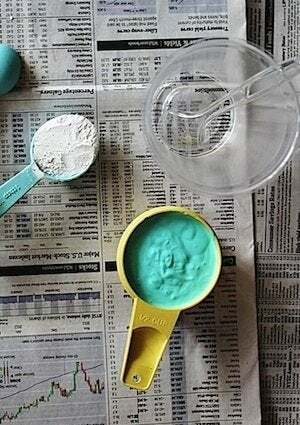 So if you’re working on a small project involving only a half cup of paint, then expect to use one tablespoon of grout. Meanwhile, if you’re covering a large wall in a half gallon of paint, you’ll mix in a full cup of grout. As thoroughly as you can, mix the grout into the paint. That means stirring for a minimum of five minutes, breaking up any clumps that start to form or stubbornly linger. Bear in mind that once you finish stirring, chalkboard paint tends to harden rather quickly, and you cannot seal the stuff for later use. In other words: Be ready to apply the paint as soon as you are done making it. Apply the first coat, let it dry for several hours, then follow up with a second coat. After that, let the chalkboard paint dry for about three days, at which point the chalkboard should be cured and ready to use. Many people, however, suggest one last prep: conditioning the chalkboard by running a piece of writing chalk lengthwise over the surface until it’s completely covered. Finish by using a dry towel to wipe the chalked-over surface clean, and you’re all done! It’s wonderful being able to make chalkboard paint yourself—quickly, cheaply, and easily—because there are so many exciting ways to use it, and you never know when inspiration will strike. Just go where the chalkboard muse takes you! Today, turn a kitchen cabinet into your family’s shopping list and reminder hub. This weekend, devote part of the garage to visualizing complicated auto repair and construction projects. Next month, put your work calendar up on the wall to accommodate your expanding business.